Yep, Brussels sprouts is one of my holiday themes this year! 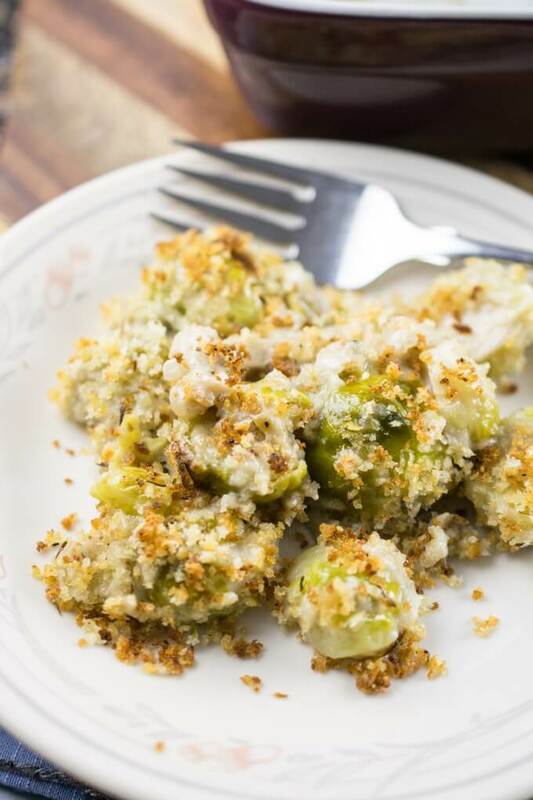 In contrast to my fresh and tangy pomegranate glazed Brussels sprouts, this vegan Brussels sprout gratin is made by folding together roasted sprouts with a creamy cashew sauce, shallots and garlic, topping the whole thing with herbed breadcrumbs and baking to golden perfection. This time of year I seem to crave almost nothing other than casseroles. Creamy, hearty, comforting… sign me up. I saw a Brussels sprout gratin recipe on Damn Delicious recently and the idea just seemed to speak to me. Of course, instead of the gruyere and heavy cream and bacon, I wanted to make a healthy (healthier, anyway) plant-based version. I didn’t want to blanch the Brussels sprouts and have to worry about waterlogging my gratin so I chose to pre-roast them while preparing the other ingredients. I cooked a whole bunch of garlic and shallot in olive oil, and then stirred in a batch of my cashew mozzarella, since the tapioca starch in that recipe takes care of thickening the sauce here. 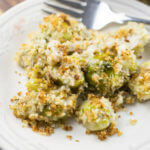 The sprouts and cashew cream get folded together in the original casserole dish and then topped with some lightly oiled and herb-infused breadcrumbs, which get nice and crispy and browned in the oven. Beneath them, a creamy sauce and perfectly cooked Brussels sprouts await. When I was researching a couple of other Brussels sprout gratin recipes, I saw someone suggest veganizing them by using coconut milk and Daiya. Omg, no! Please no. Please please make this homemade not-coconut-tasting version instead. 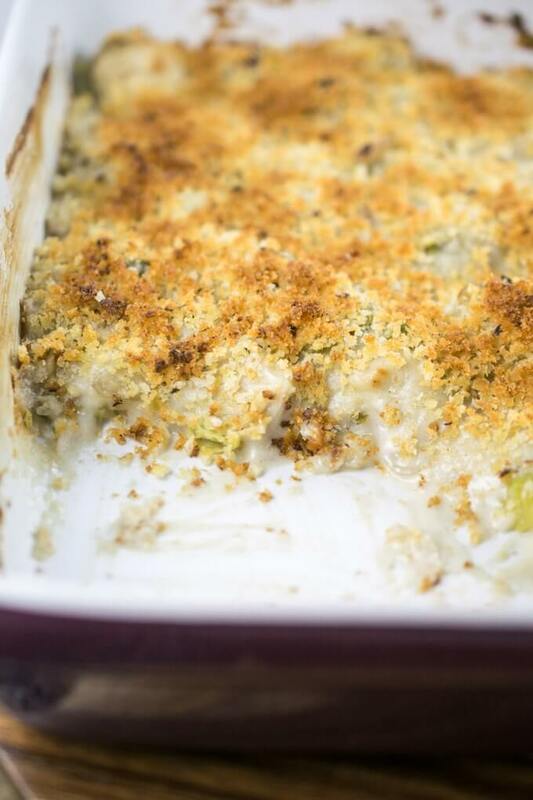 You, and especially any non-vegan diners that you share this gratin with, will be really glad that you made the right decision. Dairy-free does not have to mean chalky and weird. Cashews to the rescue! 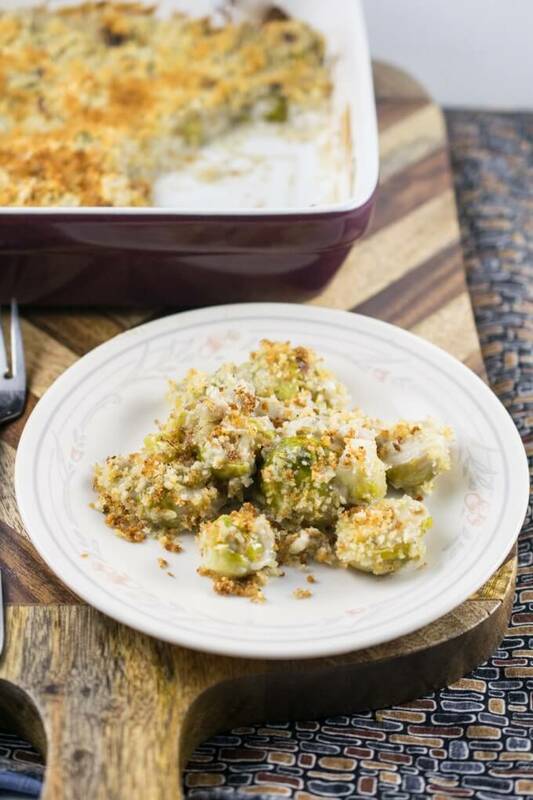 The flavors in this vegan Brussels sprout gratin are perfect for the holidays, and also easy to customize to your liking. Other suggestions of mine are to add a splash of white wine, or mix the bread crumbs with some walnuts like in my tomato baked farro. There are a few steps involved here but the whole thing is pretty darn easy to make so pour a glass of wine and enjoy! 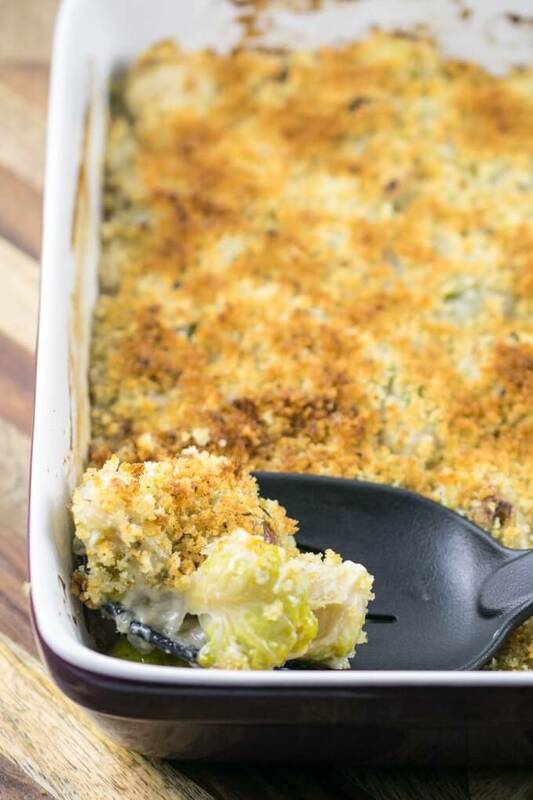 Roasted Brussels sprouts are are baked with cream cashew sauce, garlic, and shallots, and topped with crispy herbed breadcrumbs to make this amazing vegan Brussels sprout gratin! Preheat the oven to 400 degrees Fahrenheit. Toss the Brussels sprouts in a baking dish with about 1/2 tablespoon olive oil, or enough to lightly coat. Bake for about 10-11 minutes, or until just starting to get tender (they will cook more after the other ingredients are added). Remove from the oven. Meanwhile, blend the cashew mozzarella ingredients if you have not yet. Then, add 1 tablespoon of olive oil to a saucepan over medium-low heat. Add the shallot, garlic, and salt, and continue to cook, stirring occasionally, until the shallot is translucent but not browned, 5 to 7 minutes. Add the blended cashew mozzarella mixture to the pan, and stir well. Increase the heat to medium. Continue to cook, stirring very frequently, until the mixture starts to thicken and get lumpy, and then becomes smooth again. Add the mixture to the pan with the Brussels sprouts. Depending on the size and shape of your pan and sprouts, you might not need all of it - add enough to submerge all of the Brussels sprouts but not more than that. Gently stir together. Whisk together the breadcrumbs, 1 tablespoon olive oil, and the oregano, thyme, black pepper, nutritional yeast if using, and a healthy pinch of salt. Sprinkle the breadcrumbs evenly on top of the baking dish. Bake for about 15 more minutes, or until nicely browned, rotating the dish partway through for even browning. Best served hot. Inspired by this recipe but with significant changes to make it plant-based! This looks so yummy! Do you think it would be possible to make mostly in advance and then bake it right before serving? Thanks for any advice. Hey Jenna, sorry I didn’t get back to you very quickly :/. I think you could make the cashew shallot mixture in advance. I’m not sure about par-roasting the Brussels sprouts. Perhaps you could blanch and shock them, dry them really well and then store them as well until the final baking step. I think it would still work if you make sure to get them really dry. Let me know how it goes.